$1.1 Million for a Saphire watch...I bet we can do the same with acrylic & a GF! I know there are those of you with mad skills, who can do better than this! 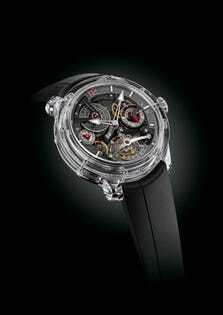 The US watch market is about to gain a transparent exclusive. Today, Greubel Forsey unveiled its $1.1 Million Double Tourbillon 30° Technique Sapphire watch-- with case entirely crafted from a single sapphire crystal.